My first medical librarian connection wasn’t officially as a librarian at all, but as the data request epidemiologist for Public Health – Seattle & King County. People from all walks of life and for all sorts of purposes would contact me to get help with finding data… and those consultations included teaching, consulting, exploring, and sometimes a lot of laughter. From the gentleman who wanted to know his own life expectancy (luckily he had 10 more years) to other health departments who wanted analytic software trainings, the work was never dull! But it also didn’t generate revenue for the health department, so as that job contracted, I looked for ways to keep connecting with people around their information needs. Reader, I went to library school! And loved it! What took me so long? But also, how could it take so long to find a job? Because I needed to stay in Seattle, I was ready to take any librarian job, but was really glad when a medically-focused one opened up at Group Health (now Kaiser Permanente- Washington). The three years I spent there were invaluable and exciting— I got good at clinical searching, I came to understand the information clinicians needed and the constraints they operate under, and I also managed a small library as a solo librarian, with two amazing staff members who were its lifeblood. I didn’t think a first job as a solo was a great idea, but if you work with the right people and if they are open to teaching you (and you are open to learning) it actually can be a great way to start. Unfortunately, they started laying off workers, and a library reorganization did occur, which led me to my next job, at The Seattle Public Library. All consumers, all the time! I dove into consumer health with glee, and really enjoyed it. I was able to create a staff intranet page with information to help staff who got questions from patrons about what the ACA was, how to enroll, etc. (the first year had been chaotic for everyone, so it was a time to integrate lessons learned). I also preached the gospel of MedlinePlus.gov to anyone who would listen, hosted programs, and absorbed the public library world’s quirky and intense vibe. I imagined myself there for the long term, but then I saw the announcement for my current job, and said a long OHHHHHH out loud—it looked as though it was written for me, connecting my data geek past and my librarian present. P.S. This picture is not of me! But I like her intensity. 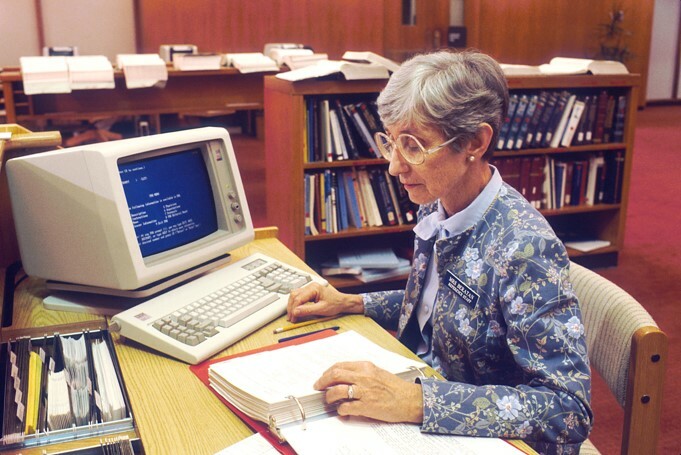 Thoughts on "The Winding Career Path of One Medical Librarian"
The librarian in the picture is Marian Beratan, a long-time reference librarian at NLM. Thanks, Scott! I think this is a wonderful picture, and it’s great to know more about it!